Here is the quick look for all top Image Editing apps for iOS and Android devices. Mobile devices such as tablets and smartphones have made life so much more convenient. Besides calling and texting, people can now do their studies, their work, their shopping and others while on the move. One of the most popular uses of such gadgets is instant picture taking. Their built-in cameras have improved dramatically over the past couple of years that image quality is no longer a problem. To make things a lot better for users, there’s also the multitude of image editing apps and tools that users can get access to. Here are six of the best, three each for tablets and smartphones running on the iOS and Android platforms. Although it’s only one of the many factors in making a quality picture, color can greatly affect the final product. With Orbit Software’s free Color Photo Edit app, users can filter their photos through a variety of colors to make them stand out. There are over 60 filters to choose from such as black and white for a moody atmosphere or sepia for a vintage look, and many more. The filters have their own editable parameters, and multiple filters can also be used together for countless combinations. 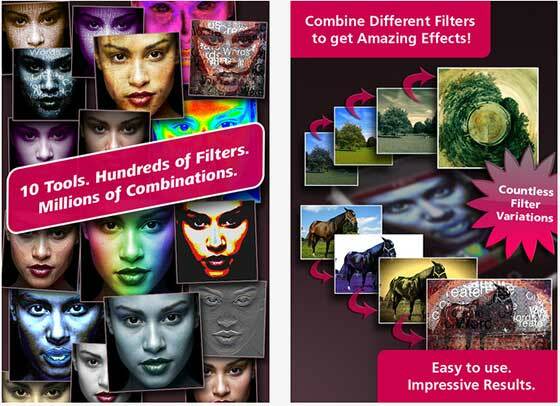 Users can even mix different pictures by using the layer tool and its 19 blend modes. If the picture is not enough by itself, users can add text with adjustable font size and color. App developer Moobila came up with this photo editor containing filters, effects and frames with full support of the 2592 x 1944 resolution of the iPhone 4’s camera. The filters are neatly organized in four categories for easy navigation. Colorize can change the colors (as its name suggests), Effects can modify the overall look, Deform can distort the shape, and Overlays can add another object or image on top of the picture being edited. There is also a selection of frames that celebrate both big and small moments in life such as an anniversary or an affirmation of friendship. Pictures can be taken right on the app itself for quicker editing, and they can be instantly shared through social media channels integrated in the app such as Facebook and Twitter. 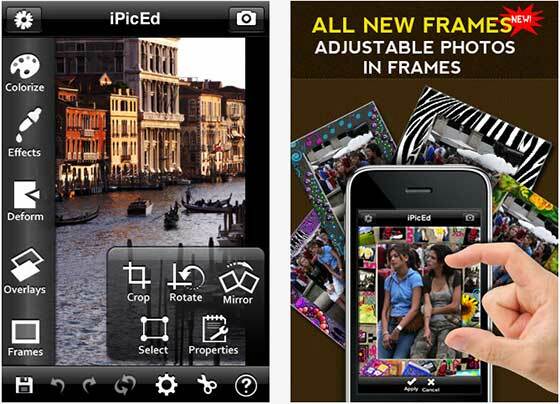 Adobe offers their premiere photo editing program for free on the iOS platform. Of course, it’s a stripped down version of the powerful application on desktop computers, but it still packs enough features to satisfy the needs of mobile users. All the basic editing tools are here such as size, shape and color editing, filters, effects and borders. Users who want more tools to play with can buy effects, camera and border packs through the app. Not happy with how the edited photo turned out? There’s no need to worry because the original image file is always saved. 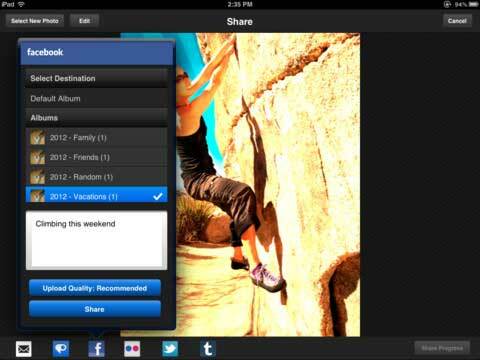 After editing, users can then store all their photos on the in-app album organizer where they can also write descriptions, create copies, and arrange them in whatever order they want. Sharing is also a breeze through the built-in social media channels of Facebook, Twitter and Tumblr. Image editing has never been as fun using this app by Shinycore. It has all the necessary tools such as sharpening, cropping and straightening pictures, but it truly shines with its extras. Assorted stickers of wacky objects like crazy cartoon hair, lightsabers, tiaras and more can be placed on pictures for a good laugh. Specific parts can be cut and pasted for hilarious head-swapping results. Captions and dialogue can be written using several fonts and word balloons. Colorful pictures get some focus through selective desaturation. You can also use the black and white filter for a retro or a more dramatic feel. This app by BeFunky INC boasts of having awesome effects no other image editor has. Some of these unique effects are Grunge, Toy Camera, Cyanotype and Gritty HDR, transforming the mundane into works of art. It also has frames resembling Polaroid, postage stamps, filmstrip borders and a lot more. Every combination possible will certainly make any photo even more memorable. Editing is straightforward through the intuitive interface, so the entire process is hassle-free. Uploading photos online is just as easy thanks to the social media sharing options. There are plenty more image editing apps available on the iTunes Store and Google Play, but any of these six apps can outdo the rest in more ways than one.